Don’t underestimate Amazon because of their global PR stunts, they are a disruptive brand because they understand data, how to acquire it, massage it, and amplify and grow it; they are a digital consumer channel; they bet on home runs when ever they can see them. YOU are the data and the info they are gathering, this isn’t about being big brother, this is digital customer service, and cutting a massive wedge in the distribution model. It is financially driven and will happen. They aren’t doing anything we haven’t seen in eCommerce; what they are doing is orchestrating a bigger play all at once; bigger capital investment to drive a return; the same as any business BUT they have a multi-year strategy to burn money to purchase customer loyalty. The last industry that did that on a massively successful scale; telecommunications – the initial radio-frequency licence fees alone were astronomical, but if you could acquire a multi-million user customer (database), a licence to print money. Retail stores who don’t produce their own products are at the biggest risk, why, because more and more spending is moving online. It one of the reasons why you see shopping centres morphing into larger and larger food courts. Manufacturers who do produce their own products here are also at risk, if they don’t hold a strong position in purely digital sales, the long term challenges may be overwhelming from sub-par or on-par competitors. 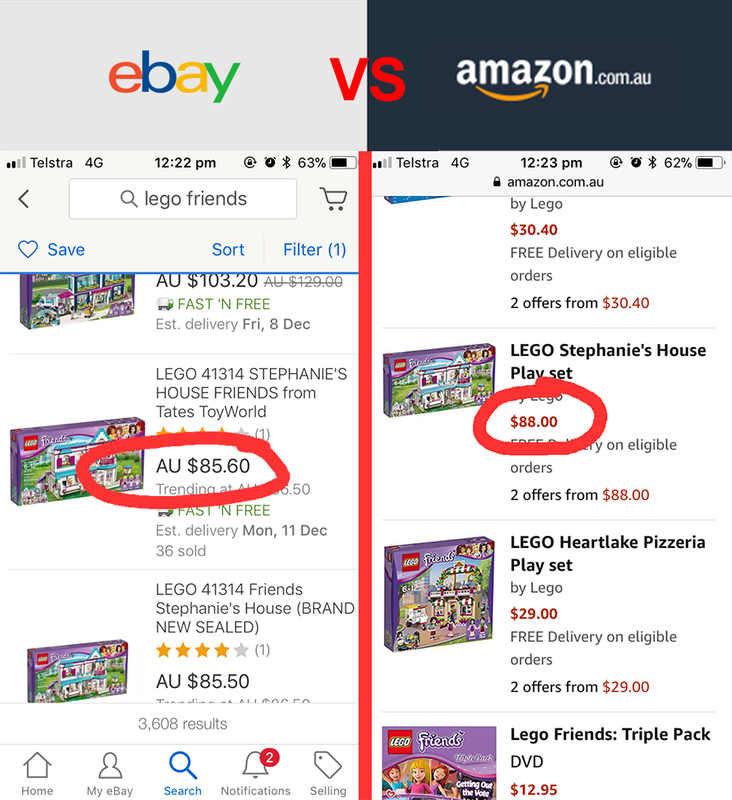 Just because Amazon are more expensive on a particular RRP search (like my lego search here vs Ebay) (and you pay delivery under $49) this is a red herring for direct competition; don’t be fooled – to Amazon, this is all about the test of what they can leverage their “Amazon will be the cheapest” PR for customer loyalty vs. the long term discounting and category highlighting, marketing we will see in market. Sink or swim Amazon have a huge runway, they also have a HUGE country… we aren’t small geographically and if they face any challenge it will be underestimating the scale of AU. Take this with a grain of salt though as smart money will be they focus on capital cities, where the majority of us live; courier companies and eCommerce is already thriving here, so I’m only half baked on this hurdle. Amazon Launches in Australia and YOUR Business. And Bigger than all of this, a warning; putting your head in the sand won’t cut it. Again, Amazon Australia, same as USA, Canada, EU, Global ; they are gathering data, learning from it and using this foundation to bet on obvious outcomes. They’ll dial up cosmetics and cut out watches, or bring in grocery and avoid nursery if the data in specific categories doesn’t show positive confidence. If it works it will be hailed as disruptive again, if not, Amazon know well beforehand. I think it will be somewhere in between, it will work for some categories, others not. The good news is, it is easy to be part of this platform, Amazon are contacting all sorts of businesses to be part of the initial rollout. It isn’t hard to on-board, especially with tools that synchronise inventory management into Amazon. Non-Manufacturing Retailers should be wary, but that doesn’t mean avoid. Manufacturers should be all over the platform. Both should be trialing the platform to see how YOUR data performs. It is the same advice we’ve put out about Ebay countless times; they are if nothing else, HUGE traffic platforms, able to expose your products to more customers, who are well down the funnel of purchasing. How do these customers compare… that is exactly what you should be into multi-channel to find out. If you’ve got a specific challenge or uncertainty ask away, or contact us if it is confidential / NDA worthy. We’re already seen many unique cases and helped vet Amazon policy and legal agreements so that our clients can benefit while de-risking the long term play. Go on, see if you can challenge us on "Amazon Launches In Australia" - Part of our 159 services at &Mine. We are quick to respond but if you want to go direct, test us during office hours.